Les biches had a long gestation, instigated early in 1922 under the title Les desmoiselles by the couturière Germaine Bongard (rather than, as sometimes stated, Jean Cocteau). 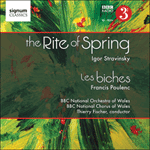 From the outset, probably inspired by the recent production of Stravinsky’s Pulcinella, Bongard intended that the ballet should include singing (Poulenc ultimately set some 17th-century texts as choruses in three out of the ballet’s nine numbers). Diaghilev took a great interest in the project and expressed the hope that it would be a contemporary Sylphide for the 1920s. Poulenc responded with a light-hearted and witty series of dances, neo-classical in style (including a direct quote from Mozart’s Prague Symphony in the Final), yet which breathe the spirit of the Jazz Age. Ironically so, since he later confessed to disliking jazz; yet Poulenc made a passable impression of its lively style in the Rondeau, albeit with syncopations which perhaps owe more to the Spanish rhythms of the ballets by his friend Manuel de Falla; and of course in the Rag-Mazurka, which incidentally contains the ballet’s other blatant quotation—from Chopin’s Polonaise in F sharp minor. And the ballet brilliantly evokes its post-war world, not least the brittle wit and lightly worn erudition of its fashionable society as suggested by those fleeting quotations. The ballet’s designs by Marie Laurencin, a close friend of the poet Apollinaire, included a drop curtain depicting what appear to be a couple of women with deer and horses, mixing and even confusing human with animal. It was this ambiguity which finally inspired Poulenc to find the present title, which can be either translated ‘female deer’ or ‘darlings’. Though its setting is clear enough, Les biches does not present a story, but rather situations or the dynamics of certain sexual relationships. It has been plausibly suggested that the choreographer Nijinska, no beauty herself, made the ballet an expression of her jaundiced view of the female stereotypes women were expected to play early in the 20th century. Nearly all the protagonists are trapped in conventional gender roles. The three athletes, who enter a room of preening women, show off all the bravura leaps of male ballet dancers (during the ‘Chanson dansée’) but perform each action in unison and abruptly rather than within a flowing dance: Diaghilev was delighted, reporting that the dancers performed “weightily, like three cannon”—clearly this is a trio of butch poseurs. By contrast comes the androgynous Garçonne—often known as the girl in blue—dressed in a very short, blue velvet coat, white tights and white gloves, who enters and crosses the room sur les pointes to Poulenc’s Adagietto, “a very supple dance in 2/4 time” (to quote the composer). Her costume was in fact one of Diaghilev’s contributions to the ballet. The dancer, Vera Nemchinova, had originally appeared in rehearsal dressed in a long velvet frock-coat; disliking its appearance, Diaghilev took a pair of scissors and cut away its collar to make a wide V-neck, then proceeded to drastically reduce the length of the coat. “I feel naked!” protested Nemchinova as Diaghilev exposed the full length of her legs. “Then go and buy yourself some white gloves!” retorted the impresario. Nijinska herself danced the hostess (whose big number is the ‘Rag-Mazurka’), a character who for all her feminine accessories—Chanel pearls, cigarette holder and plumed headdress—dances with a vigorous, masculine style, so subverting her sexual stereotype. Only two young girls dressed in grey—Sapphic yet innocent—appear unaffected and genuine in their mutual attraction (in ‘Petite chanson dansée’). Poulenc was absolutely delighted by Nijinska’s work, writing to a friend: “The choreography of Les biches is a masterpiece. It is ravishing from beginning to end and exactly what I wanted”.